For an island group which is not particularly known for the quantity and vastness of its sandy beaches, the title of this essay sounds bombastically off mark. Yet, in spite of this geographical fact, the Maltese archipelago does contain a number of sandy beaches, some of which have also managed to continue to sustain a sand dune hinterland with a resultant unique natural habitat: a habitat made even more interesting by the fact that it contains some of the rarest and threatened flora on the islands. Sandy beaches generally form at the mouth of valleys where the land slopes gently into the shallow sea. Millennia of seasonal rains cause fine grained material to be carried by storm water action to be deposited on the sea bed until a thick layer of sand creates the beach. The vagaries of weather including wave action pounding on the coast deposit quantities of sand on land leading to the familiar crescent shaped sandy beach sloping gently into the sea. The type and quality of material which is transported by water down the valley bears a strong relationship with the type and quality of beach, with some beaches being composed of stones and pebbles while others are composed of sand. Here in the Maltese Islands one can distinguish between two main types of sandy beach: the ones with reddish sand, such as Ramla l-Hamra and San Blas on Gozo and Ghajn Tuffieha, Golden Bay and Gnejna on Malta and the ones with a lighter coloured sand such as the beaches in Mellieha, Armier, Paradise Bay and Balluta Bay on Malta, Xlendi Bay on Gozo and the Blue Lagoon, and Santa Marija Bay on Comino. 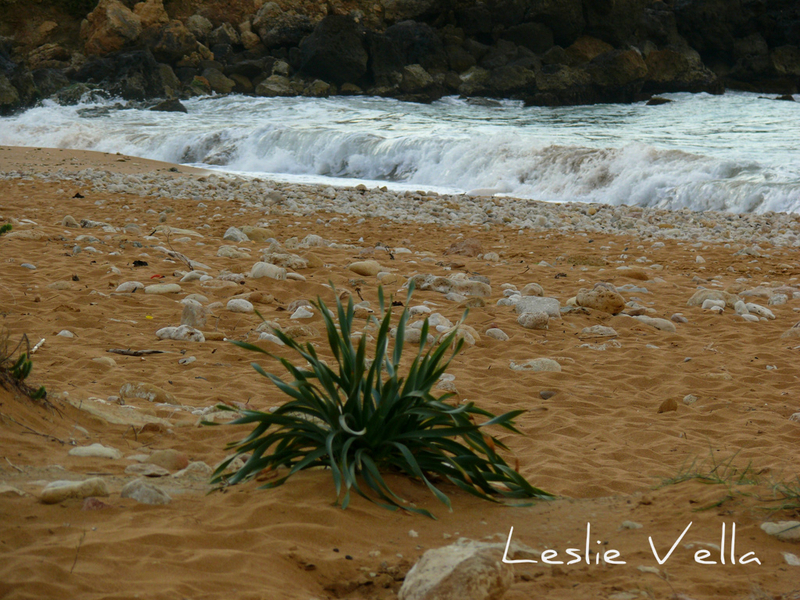 Maltese beaches with reddish sand are generally to be found in places where there are exposed clay slopes. In Maltese geology, the clay layer is topped with a deposit of “green sand” which oxidizes to the more familiar red when exposed to the atmosphere. On the other hand, the Maltese beaches with the lighter coloured sand are ones in which coralline or globigerina limestone layers are the predominant surface of their valley sources. 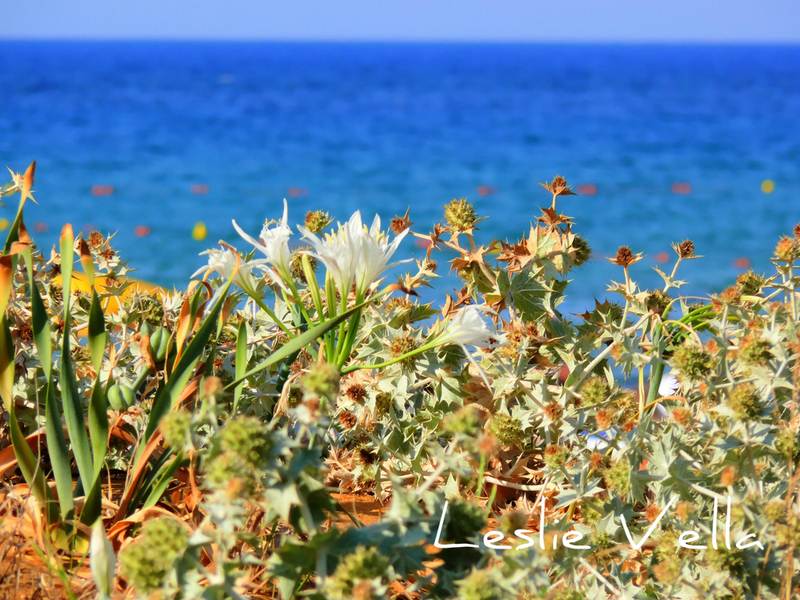 Beaches are traditionally self replenishing through the annual draining and depositing of material, and the biggest beaches that are still in existence in Malta are the ones whose watercourses are still undisturbed, such as Ghajn Tuffieha, Gnejna and Ramla l-Hamra. Unfortunately, the construction of roads just a few metres behind a number of beaches, generally followed by intensive construction activities have choked the supply of sediment to a vast number of Maltese beaches with the result that previously bigger sandy beaches have slowly wasted to sorry remnants of what they once were. Examples of such declining beaches include relatively big beaches such as Mellieha, Armier and Xemxija and a range of smaller ones which have almost faded into obscurity such as Salina, Qalet Marku, Balluta, Xlendi, Rinella, Marsascala and St George’s Bay in St. Julians. All of these locations are characterized by a road and construction which has cut their link with the valleys behind them, with the latter having been recently replenished with crushed granite imported from a terrestrial source in Jordan to avoid contamination with invasive marine organisms. Sand dunes are the natural hinterland of undisturbed beaches. They form the buffer zone between the beach and the valley floor behind it. They consist of sand which accumulates at the back of the beach as a result of wind and wave action. They are a sort of middle ground: an area where the predominant material is sand but where vegetation still grows. The sand dune is an area where the underground water flowing downwards from the valley is predominantly fresh to brackish (depending on the season) as opposed to saline beneath the exposed sand of the beach. This means that sand dunes can support a variety of plant life which is specially adapted to their unique environmental conditions. It needs to be life which can survive extreme aridity and heat. It also needs to adapt to the reality of literally living in a shifting environment where the action of wind and water can affect rapid changes to the profile of the landscape. This calls for strong root systems which are capable of penetrating deep to seek water and sustenance. 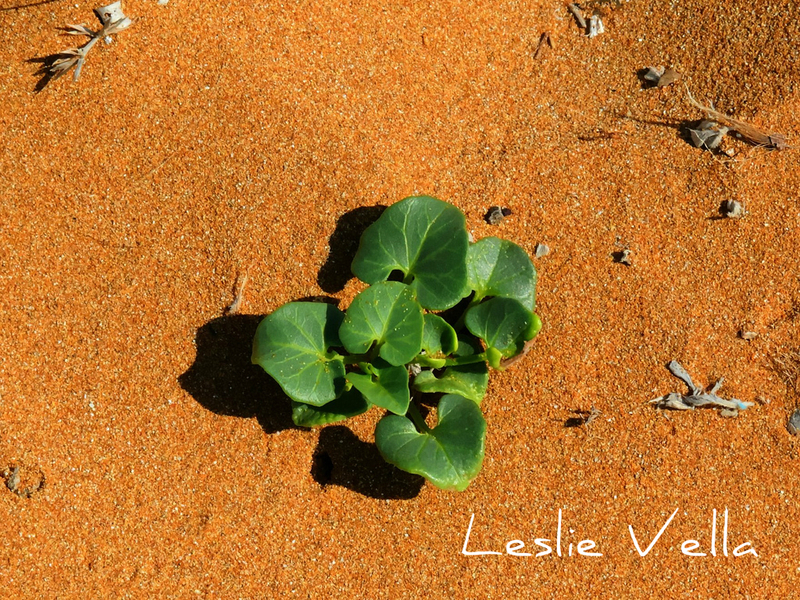 For it is from down in the depths of the sand dune that these plants draw the essentials to remain alive and thrive. As already indicated, this is one of the rarest habitats in Malta. Already scarce to start with given the small number of sandy beaches in the Maltese archipelago, this habitat has suffered huge losses due to urbanization, extension of coastal road networks and mass tourism activity. In a way, it is a miracle that some remnants of it still survive! The best examples of reasonably intact sand dune habitats to be found on these islands are few. The best by far is the one in Ramla l-Hamra Bay on Gozo. This glorious beach has managed to survive the ravages of time and development primarily through the almost total lack of development in its pristine valley. However it has also found additional assistance from a sub-sea wall, built during the reign of the Knights of St. John which was designed to ground enemy shipping attempting to beach there. This wall has over the centuries assisted in retaining vast quantities of sand from being lost in deeper waters with the result that Ramla is by far the largest sandy beach in the country. The sand dune in Ramla is reasonably intact, generally well protected and well marked as a cordoned-off zone which is off limits to beachgoers. This is in sharp contrast to the situation prevailing until a few years ago when campers had a free rein to pitch their tents among the dunes, making campfires and wreaking havoc and damage to this habitat in the process. On the main island of Malta, the best sand dune habitats are to be found in Ramla tal-Mixquqa (Golden Bay), Ghajn Tuffieha Bay and Gnejna Bay. A reasonably extensive, though seriously threatened and degraded dune also exists in the hinterland of Ramla tat-Torri beach, surrounded by the illegally constructed beach houses prevalent in this part of the north of Malta. A huge sand dune also used to exist until the mid 1970s in the area of Mellieha Bay now housing the bird reserve. Remnants of this sand dune remain incorporated within the grounds of the reserve. Other small examples of sand dune habitats can be found in Santa Marija Bay on Comino and near the minute Slugs Bay in l-Ahrax tal-Mellieha. 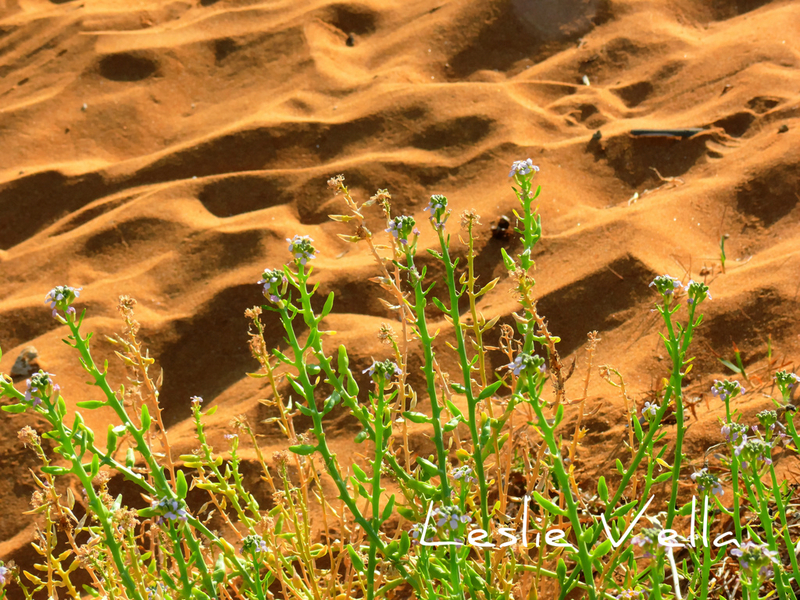 Being as rare as they are, sand dunes offer a special fascination, although they often go unnoticed by the absolute majority of people who bypass them on the way to the beach. 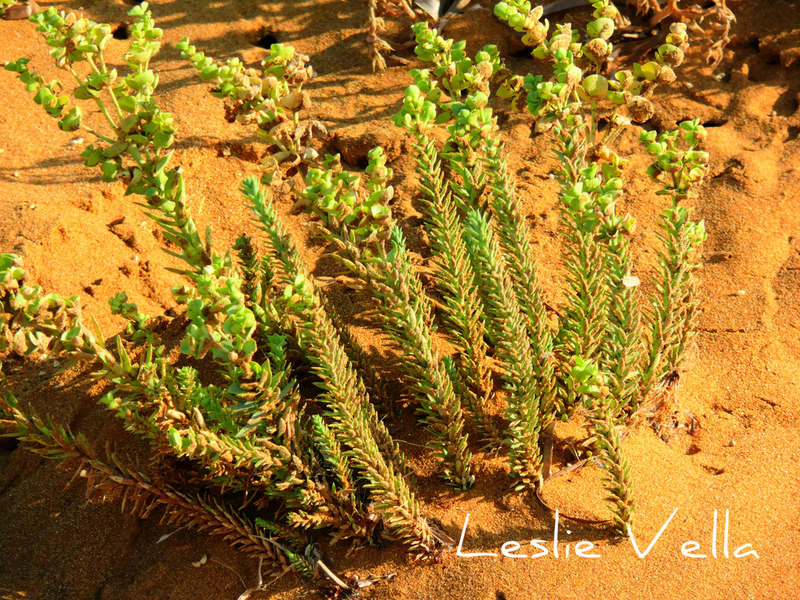 They contain plants which are amazing when considering their capability to sprout almost effortlessly from barren sand. 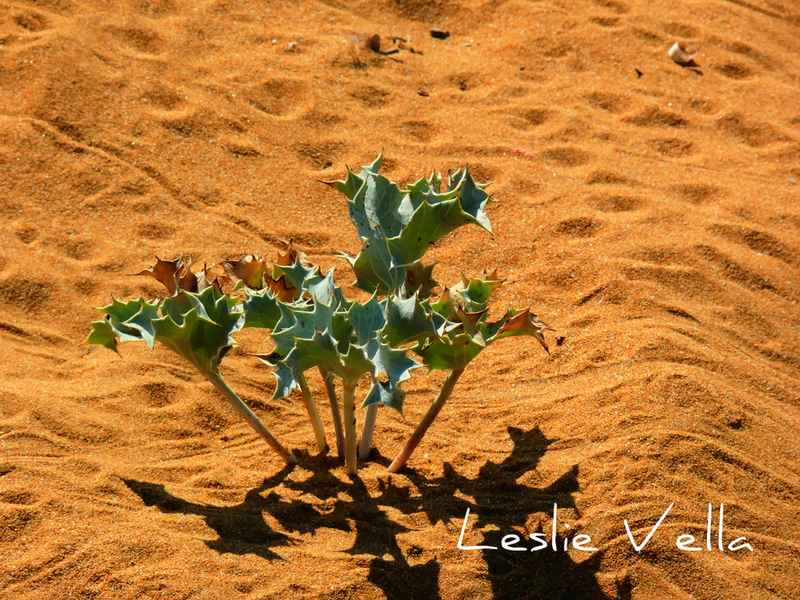 Witnessing the tough delicateness of plants emerging almost effortlessly from dry, hot sand on a hot summer’s day is a miracle of nature that is worth pondering upon, even if for a few seconds, if you happen to be walking by a sand dune. 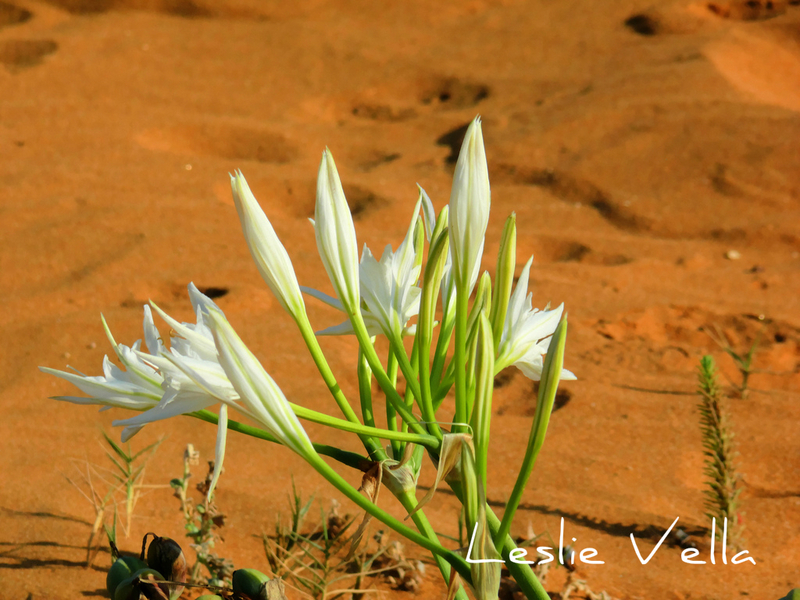 Needless to say, given their rare and threatened status within the Maltese biosphere, all the plants in the Maltese sand dune habitat are in some way or another threatened. What differs is the level of threat which they face: with some being almost certainly extinct and others not having been observed for years. Even those plants which are still fairly common in the surviving dunes: plants such as the Sea daffodil (Pancratium maritimum), the Sea Medick (Medicago maritima) and the Sea Holly (Eryngium maritimum) are still rare and threatened, while others such as the Prickly parsnip (Echinophora spinosa) and the Sea bindweed (Calystegia soldanella) are classified as very rare. The versatile spurge family is also present in the sand dunes, particularly through the aptly named Sea spurge (Euphorbia paralias), with another coastal species the Sea Rocket (Cakile maritima) also making a presence. A number of thistle species have also successfully colonized the sand dune habitat with one of the most common being the Common golden thistle (Scolymus hispanicus). This list mentions but the most common of a range of rare and threatened species, struggling for survival in one of Malta’s harshest habitats, and that’s against some stiff competition! Within this list my personal favourite is the Sea daffodil, a plant which is beautiful at all times of the year, but which peaks during the impossibly hot and dry summer months. For it is during this most arid of periods that this surprising plant decides to produce an abundance of huge, delicate, white flowers. Flowers are usually associated with the mild spring period when sunshine and rainfall are both to be found in copious amounts in average temperatures. 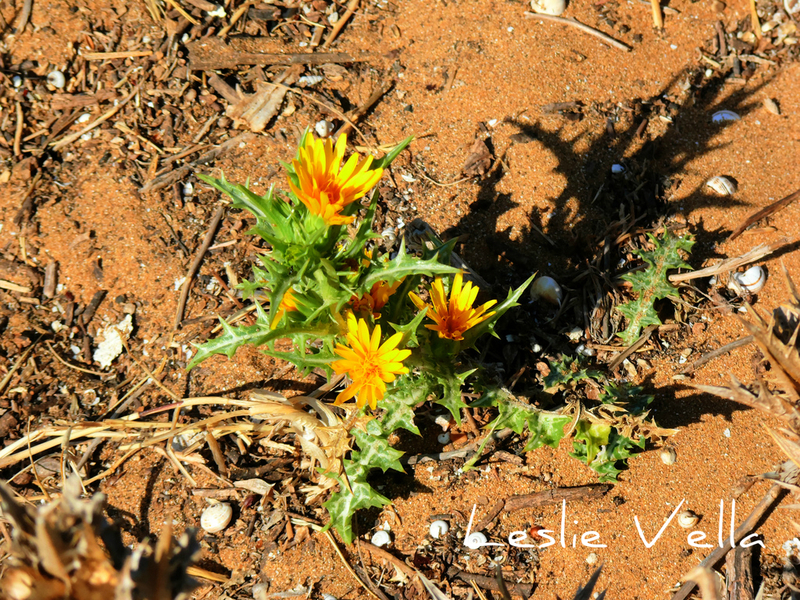 Witnessing these flowers on stalks emerging from sand so hot that you can’t walk on it in August when it has not rained for around ten weeks is an experience which is stupefying if only you just stop and wonder for just a few minutes. 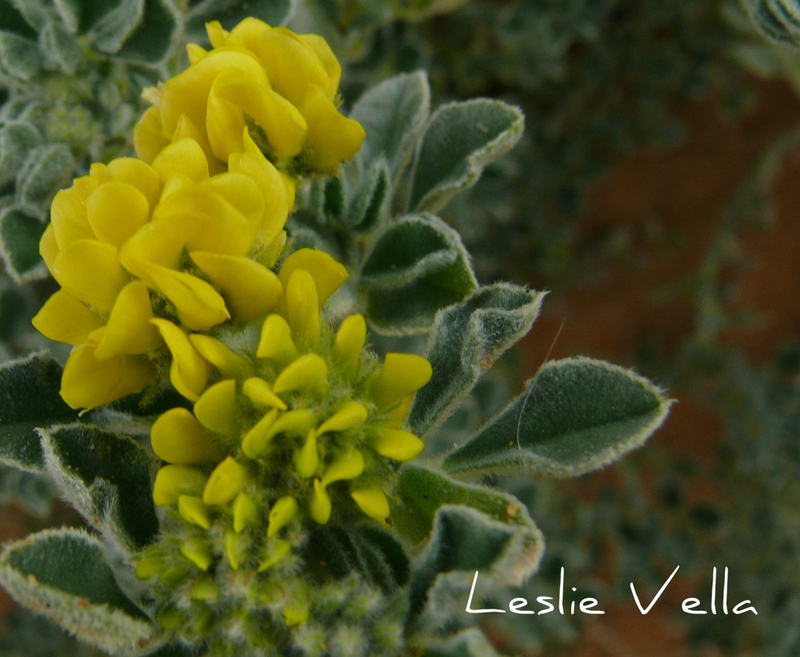 Whilst this rare habitat, known in Maltese as gharam tar-ramel, continues to be threatened, it is positive to see that it is enjoying increasing protection and recognition. The management of beaches such as Ramla l-Hamra and Ghajn Tuffieha by NGOs such as the Gaia Foundation has not only controlled the wildest of excesses such as camping, four-wheel drive off-roading and other indiscriminately destructive activities, but has also led to the introduction of practical steps, such as cordoned-off zones, limiting human activity on the dunes. Elsewhere, beaches vying for the Blue Flag Status also need to introduce visible elements of nature protection and appreciation to their users. In a densely populated country such as Malta, facing all the pressures that it does from an active population coupled with the needs of international tourism, the preservation of the natural environment will always be an uphill struggle. The sand dunes represent one of the most threatened habitats we possess and may well be one of the first to disappear if complacency and insensitivity win over care and awareness. Losing them will be a great loss which I sincerely hope will never come to pass. 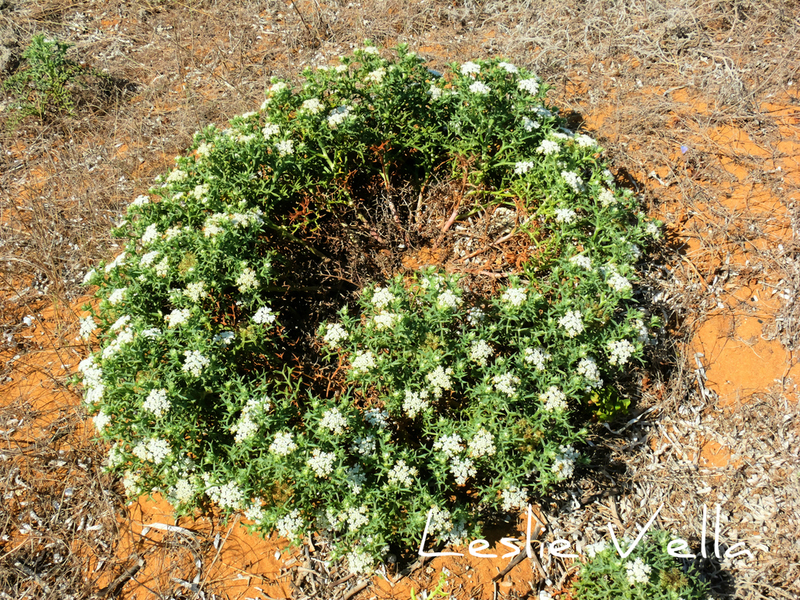 Next time you’re in Ramla Bay do spend five minutes observing this small world and I’m sure that you will be overawed by its simple beauty and its tenacity. I am sure that becoming aware of its delicate ruggedness will convince you of the need to preserve it for posterity. A trip to the past. 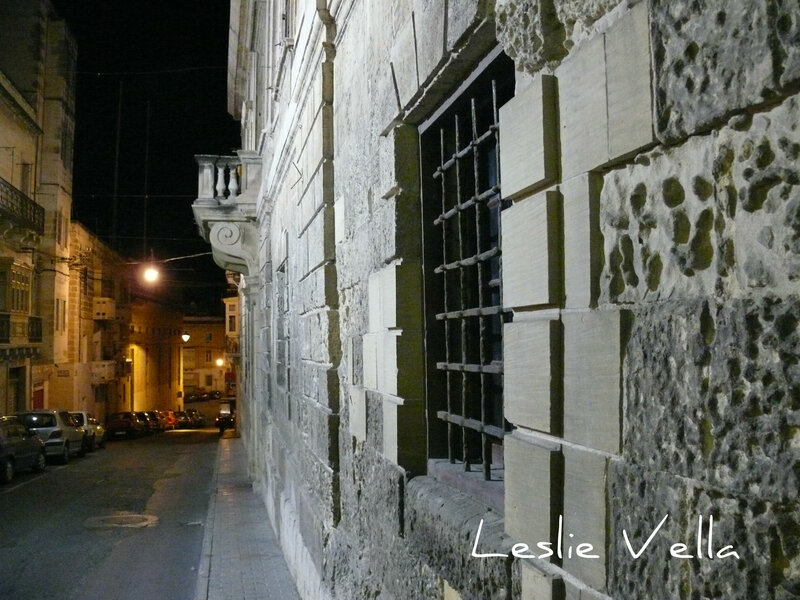 Visiting my Birgu…..
Late last winter, I was enjoying a rare evening of solitude. My wife was abroad at a conference and my children were both out with friends. That gave me a solid three hours of being on my own and the dilemma of what to do with the time. 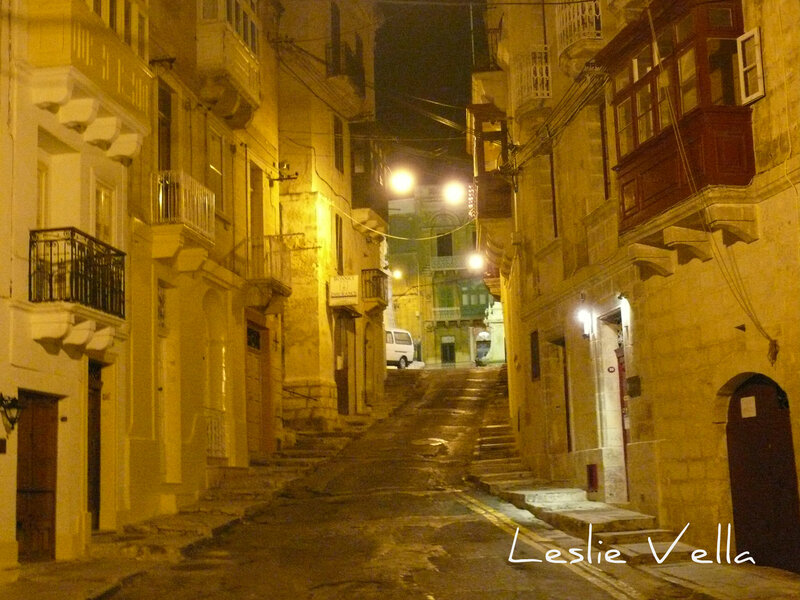 I settled on visiting Vittoriosa, the town where my paternal grandmother used to live and where I can recollect countless moments of joy and nostalgia from my childhood. 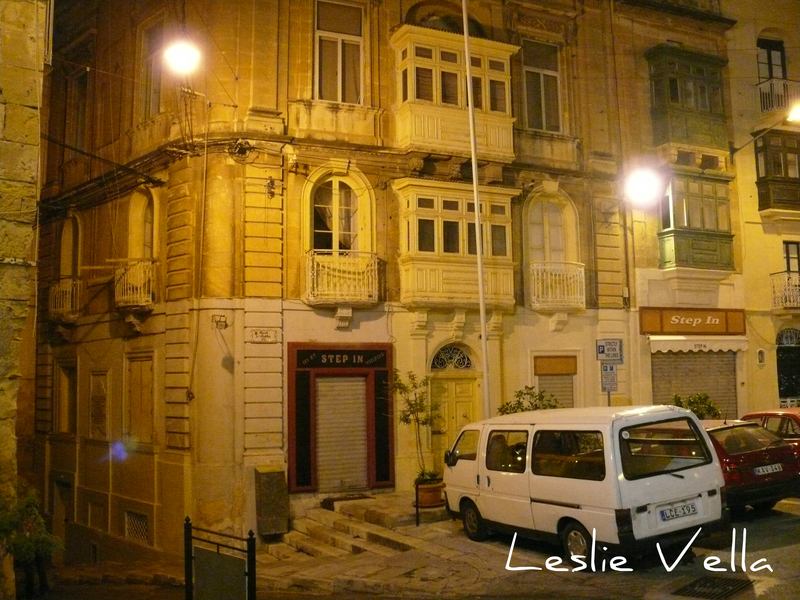 Armed with my trusted Leica, I drove there and parked my car behind the Maritime Museum. 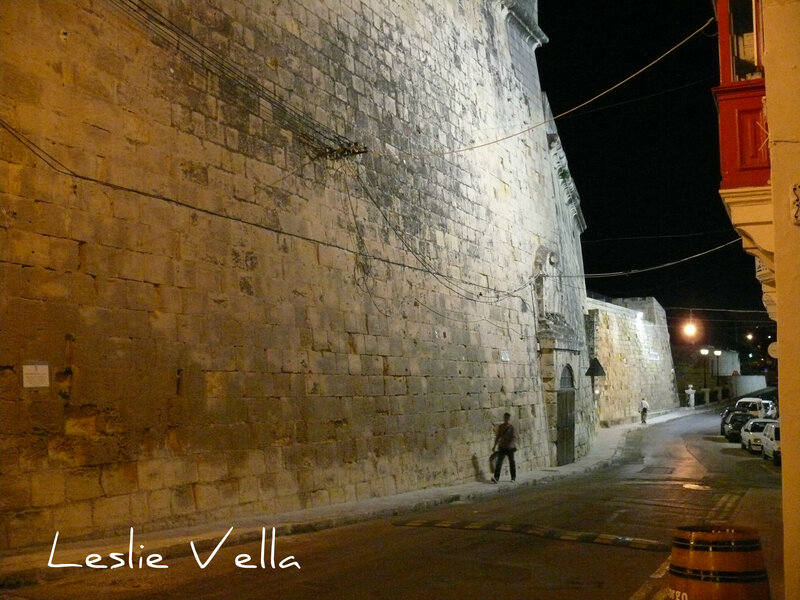 Citta Vittoriosa, the victorious city: a romantic name bestowed upon it after the lifting of the Great Siege of 1565. 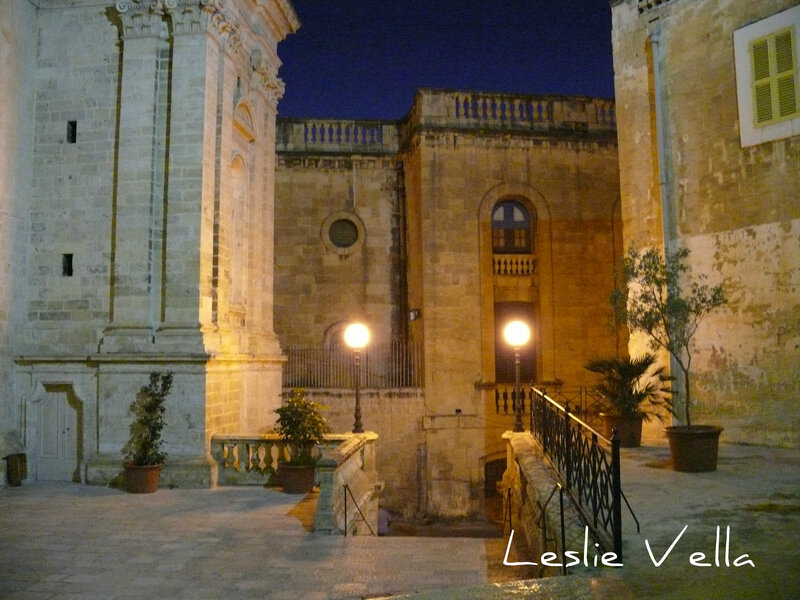 But popularly known as il-Birgu, a corruption of the Italian borgo or burg: the town beside the mighty Castle by the Sea – Castrum Maris or Fort St.Angelo. It was already dark when I got there, but the place was well lit. It was early enough for some shops to still be open and for some, but not too many, people to still be doing their rounds. I walked up the steps to the left of St Lawrence’s church, past the chapels and the church buildings and found myself at the corner of the square. It was then that 40-year-old memories started to flood my thoughts. I was back in the mid 1970s; a ten year old visiting my Nanna Karmena and all the ghosts from that past suddenly swam into my conscience. Very few of the places and shops I remembered survive today, although the buildings are still the same. In one corner I saw the shop that used to house Sophie’s Bazaar, a small establishment which virtually stocked everything you cared to buy. 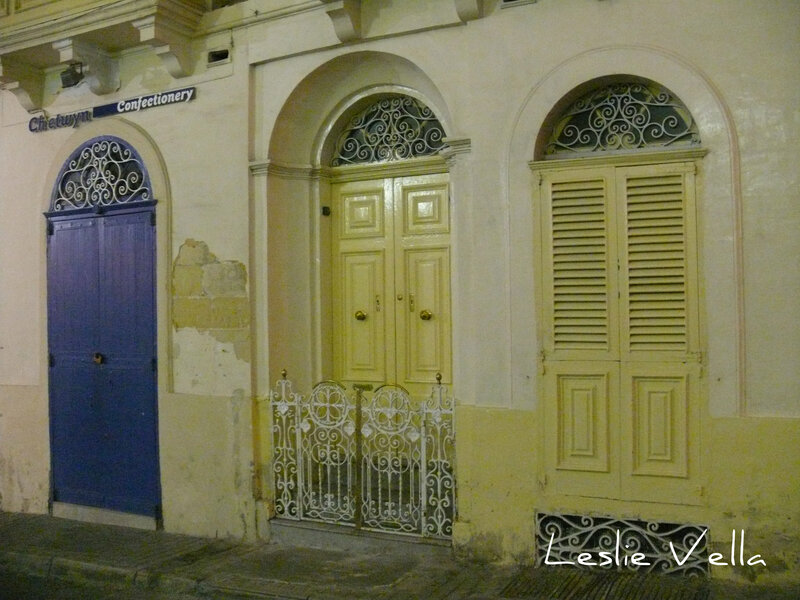 Opposite Sophie’s an old door stands guard over where Pawlu’s first butcher shop once stood. Pawlu, my father’s cousin, eventually expanded the business and moved to a bigger shop, now a wine bar, at the other end of the square. Mifsud’s Garage, the chauffeur driven service Ta’ Billurasu still advertises its original services but the shop itself now sells household goods. Moving on, I climbed the hill towards St Dominic’s church and priory. Many of the little shops of my childhood are now wine-bars and restaurants, and Sur Tonin’s old Pharmacy has been redone. The Inquisitor’s Palace, abandoned, dark and scary in my childhood is now skilfully restored and a fully functional museum. My favourite pasturi shop, where little clay figurines of saints and religious figures were occasionally purchased, is now a confectionery. I climbed down again, through the side streets. I walked past a garage: a third of a century ago it was Nini’s grocery, where I would be sent on minor errands to buy 50gms of ham, a bottle of milk, a smear of kunserva tomato puree on some wax-paper. I walked down the hill to the Maritime Museum. Zahra’s barber shop used to be there, and, at the foot of the hill, the Rose, Shamrock, Thistle Bar, overflowing with intoxicated, rowdy British sailors. All are gone now and only the ghosts in my mind remained. I walked to the seafront, past my late Grandmother’s flat. The yachts have replaced the Royal Navy and instead of the foreign sailors Ix-Xatt now attracts other outsiders: young Maltese who barely knew the place existed before it became chic and fashionable. Vittoriosa has changed, mostly for the better. It is now more organised, cleaner, beautiful, and prouder perhaps. It is better known and popular. Formerly part of the impenetrable south, it is now a landmark. This is in no small way due to its people, proud of their little city as they are. As I walked the little streets however, with their flower pots and their period light fittings, I could not but reminisce of when it was cruder but more real. And somehow, I preferred that blemished past to the synthetically beautified present. Strange thing nostalgia.